George Grimshaw was born on August 4, 1825 in Longsight, near Manchester, in Lancashire. His mother was Elizabeth Grimshaw (born about 1803), and George Hewitt (born about 1799) may have been a stepfather. George and Eliza Snell were married in Manchester Cathedral on December 5, 1847, and the couple had two children, Elizabeth (born May 12, 1850) and James (born August 13, 1852). Eliza may have died in childbirth, as her death occurred on August 13, 1852. George remarried to Hannah Harrison, also in Manchester Cathedral, on August 13, 1854 (a coincidence with the day being the same as the day Eliza Snell Grimshaw died). George and Hannah apparently converted to the Mormon faith, as George emigrated to Utah on the John J. Boyd in 1862. Hannah and her stepdaughter, Elizabeth, followed in 1863 on the Antarctic. The family settled in Parowan, Utah. There is no record of the second child, James, having also gone to Utah. George then married again, to Emeline Guymon on August 13, 1864 (another date coincidence). Emeline Guymon was born on September 26, 1847 at Kanesville, Potawatomie, Iowa, to James and Mary Ann (Couch) Guymon. George, Hannah, and plural wife Emeline lived out their lives in Parowan and are buried there. George died on February 26, 1899. Apparently no children were born to either of these marriages. 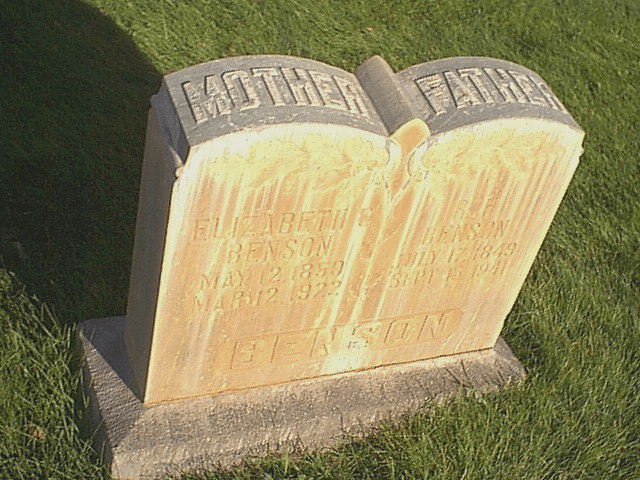 George’s daughter, Elizabeth, married Richard Heber Benson on October 24, 1868 in Salt Lake City, and the couple had at least six children – William Oscar (1873-1903), George Heber (1874-1911), Anna Medora (1877-1950), Alvin Richard (1879-1937), Don Forrester (1883-1884), and Alice Benson Dalton (1892-1985). Elizabeth and Richard also apparently lived out their lives in Parowan and are buried there. Elizabeth died on March 12, 1922, and Richard died on September 15, 1941. 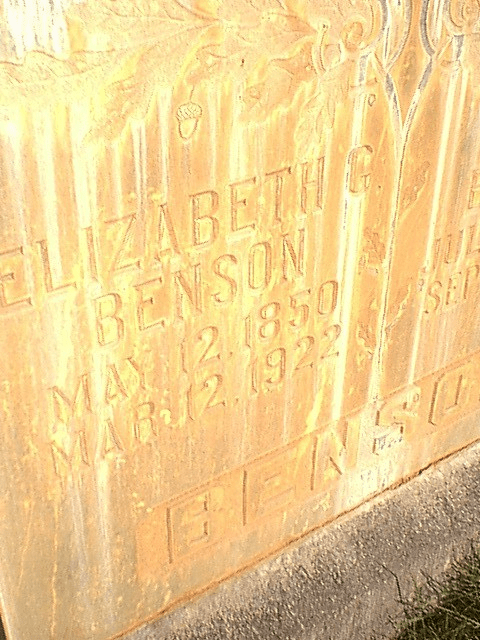 Interestingly, Emeline (Guymon) Grimshaw married Nathan Benson on May 24, 1900, about 9 months after George Grimshaw’s death (and about 11 years after Nathan’s wife, Ann, died). After Nathan’s death on July 26, 1912, she married Nathan’s brother, Richard Benson, on September 28, 1922, about six months after Elizabeth (Grimshaw) Benson died. Emeline died on December 14, 1934. The 32 Grimshaws who came to the U.S. on Mormon emigration ships are shown in the table below. The Grimshaws arrived in 1851, 1855, 1859, 1862, 1863, 1866 and 1868 (two voyages). The John Grimshaw who departed in 1863 appears to be entered twice. The Duckworth who departed in 1855 (uncle to the one who departed later, in 1862) was not Mormon even though he was traveling with his sister who was LDS. The records of George’s immigration in 1862 (on the John J. Boyd) and Hannah and Elizabeth’s departure in 1863 (on the Antarctic) are shown in italics below. Did George and Duckworth Grimshaw depart together on the John J. Boyd? How well did they know each other? Did the family members who followed in 1863 also know each other? Was there a continuing connection, with Duckworth in Beaver and George in Parowan, about 35 miles apart? Married Eliza Snell, 1849, England. Died 13 Aug 1852, Manchester, Lancastershire, England.